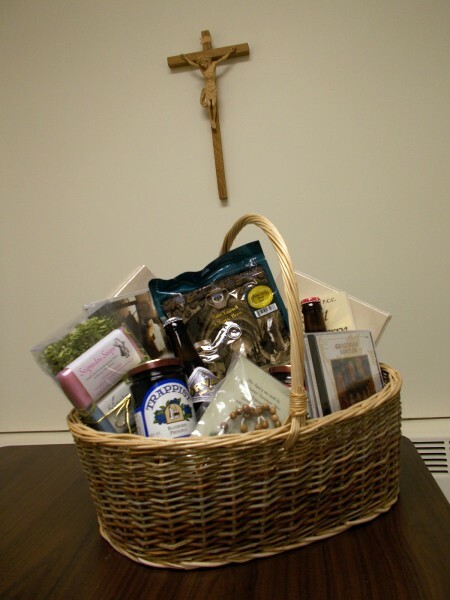 You can bid on this Monastic Gift Basket if you go to the Camp Gray Benefit Dinner February 23rd at St Francis Xavier Parish in Cross Plains. I think it’s going to be a silent auction item. Apparently, various groups are putting together gift baskets to raise funds at the annual Benefit Dinner for our diocese’s great Catholic summer camp, Camp Gray. The Cathedral Parish young adults were asked to do one, and I thought of a theme I would enjoy and volunteered to put it together: things from monasteries, which make great gifts! The young adults of the Cathedral Parish donated the funds and I ordered candy made by Trappistine nuns, preserves made by Trappist monks (these are available from multiple sources, I got mine from those Trappistines), soaps made by Dominican nuns, the famous Mystic Monk Coffee roasted by Carmelite monks, Gregorian Chant from the French Benedictine Abbey of Solesmes, the DVD documentary Into Great Silence about the Carthusians, the classic book about life as a Poor Clare nun A Right to Be Merry, and more. Nathan, one of the young adults, kindly supplied 2 bottles of Belgian Trappist beer, readily available locally from Woodman’s! Part of the point of this theme was to support religious life, as well as Camp Gray. But I have repeatedly noticed monks and nuns do not like to be outdone in generosity. I mentioned it was for a gift basket as a silent auction benefit for our diocese’s Catholic summer camp, and the Dominican nuns who make the nice soap sent free one of their handmade rosaries, and the Trappistine nuns I ordered one box of candy and 2 Trappist Preserves, sent TWO additional boxes of candy. One of them was a smaller size box of the same Butter Nut Munch candy I’d ordered so I cut it into smaller pieces for people to sample at the Camp Gray dinner and maybe be inspired to order some from the nuns later as gifts. One time a few years ago I was feeling lonely on Valentine’s Day and sent a donation of not more than $10 via the internet to the Carthusian monastery in England, and not long after, I cried I was so touched when I received (from England) a wonderfully profound book of poetry by one of the monks with a cheery note of thanks from Brother Simon. I had bought books from them a couple times so he probably remembered me. The most austere Catholic hermit monks in the world, they are not scary they are totally lovable. I feel certain you can still register for the Camp Gray Benefit Dinner (follow that link). It’s $60 per person, on Saturday, February 23rd at St Francis Xavier Parish in Cross Plains. Silent Auction and cocktails start at 5:30. Thank you so much for posting this Elizabeth. The Benedictine brothers at the monastary in Cullman, AL also make a number of nice things and I’ve bought some over the years. I was not aware of Into Great Silence – will definitely have to check that out. Praying that you have a very successful benefit dinner for your summer camp. Great choices for the basket! Let’s hope it generates strong bidding! I so admire the Carthusians. I have watched Into Great Silence many, many times. And have read books by and about them. I wish I was younger so that I could join them. I want to add that there is a Carthusian monastery in Vermont! The only one in North America. http://transfiguration.chartreux.org/ Saint Bruno pray for us. Yes, I have sometimes sent them stipend Mass intentions!